The Award, the UK’s highest accolade for business success, was made in recognition of Hope for Tomorrow’s achievements since its founder, Christine Mills, MBE, set up the charity with a single aim: to bring cancer care closer to patients. Today ten Units have been successfully launched and are in operation in partnership with NHS Trusts around the country. They bring vital cancer treatments to patients, reducing travel, waiting times and the stresses and strains of busy hospitals. The Queen’s Awards are made annually by HM The Queen and are only given for the highest levels of excellence demonstrated in each category. Christine Mills said: “Without our very special team, including staff, supporters, patrons, trustees, the nursing teams and our partners in the NHS, we wouldn’t be here today. 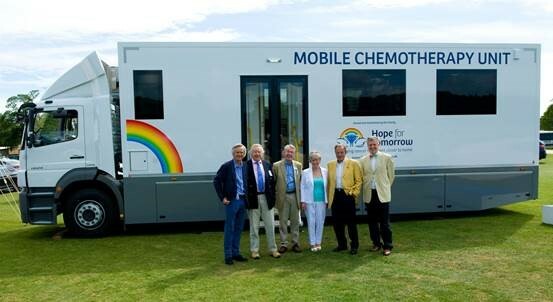 Our simple and innovative business model has enabled the public sector to adopt our Mobile Chemotherapy Units, easing pressure on Oncology Units, staff, and most importantly, patients.